In 1 minute, indulge hair in a nourishing treat with 98% naturally derived ingredients. 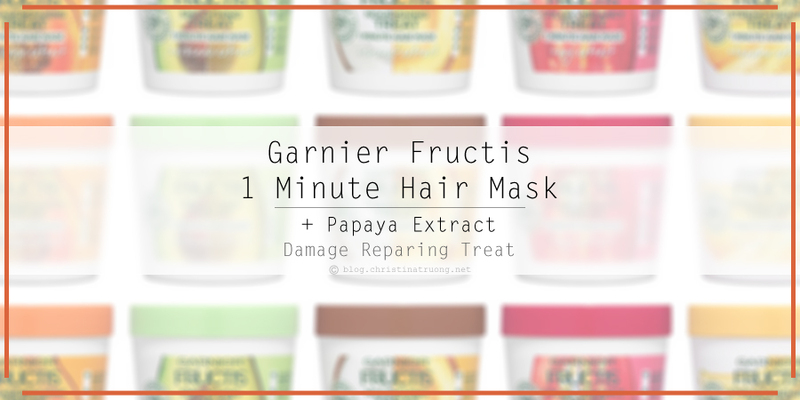 Damage Repairing Treat 1 Minute Hair Mask + Papaya Extract helps get soft, smooth and damage repaired hair. Vegan formula - no animal derived ingredients or by-products. 94% biodegradable formula. No weigh down, no silicones, no parabens, and no artificial colourants. As a conditioner - After shampoo, apply to hair from root to tip. Rinse. As a hair mask - After shampoo, apply onto wet hair and leave on for 1 minute. Rinse. As a leave-in treatment - Apply to damp hair for frizz control and colour protection. Garnier Fructis 1 minute hair mask does just what a 10-minute hair mask would do but in just ONE minute! The results were the same but in less the time. The texture of the hair mask is like conditioner, it's not too thick but almost lotion-like. The fresh scent of papaya is refreshing and although it does seem as if the scent will linger for a while, it won't. Applying the product as a conditioner/hair mask, the product rinses off easily. When I used it as a leave-in treatment, it didn't leave any sort of product residue instead, the product absorbed right into my hair. In the end, after trying out both uses, my hair felt and looked amazingly smooth. Find the hair mask that’s right for you and treat your hair to a dose of super fruit extracts. What are your thoughts on Garnier Fructis 1 Minute Hair Mask? Have you tried or use hair masks?